The annual JCI Senate Scholarship applications are available to download and share with HS Seniors in NY State. This package contains information and directions for applying to the United States JCI Senate Foundation Scholarship Program. Each year (April) $1,000 grants will be awarded to graduating high school seniors in the United States, who plan to continue their education at accredited post-secondary colleges, universities or vocational schools. The number of grants awarded annually will be at the discretion of the United States JCI Senate Foundation. They must be used for educational expenses in the first year of full-time study. Checks awarded will be made out in the name of the recipient and the educational institution of their choice. NYS JCI Senate also has a $150 and $100 Scholarship for the 1st and 2nd place Applications. These 2 winners will be submitted to the national organization to be judged for the $1000 Scholarships. In the Past the US JCI Senate has given out up to (20) $1000 Scholarships per year. The 2017-2018 School year has begun and the NYS JCI Senate will be selecting 2 High School Students from the Scholarship applications to go onto the National Scholarship for $1000. The top 2 NYS Winners will win $150 and $100 from NYS to assist them in their college experience. Please feel free to share this with HS Seniors, Guidance Counselors and schools in your area. Please be sure to properly fill out the application and it must be post marked by January 5th. The NYS JCI Senate wants to thank all the HS Seniors for applying to our annual Scholarship. We know all of you will be successful pursuing your goals in college and will make your family proud. Their Applications have been forwarded to the JCI Senate National Scholarship Committee where it will be judged along with other State winners from around the country. (15-20 scholarships are awarded) $1000 Scholarships. Eligibility: Graduating high school seniors in the United States, where that state has an active JCI Senate program (see http://www.usjcisenate.org [under scholarship] or http://www.usjcisenatefoundation.org for a listing of eligible states). You must be a U.S. citizen to apply for this scholarship. Each year, the U.S. JCI Senate Foundation (“the Foundation”) grants $1,000 scholarships to graduating high school seniors who plan to continue their education at accredited post-secondary colleges, universities or vocational schools. The number of grants awarded annually is at the discretion of the Foundation and must be used for educational expenses in the first year of full-time study. Checks awarded will be made out in the name of the recipient and the educational institution of the recipient’s choice. Applications must come from high school students who are U.S. Citizens graduating from U.S. accredited schools. This may include state approved home school and state approved GED programs, cyber schools, and overseas U.S. approved schools. The Foundation is a fully qualified, IRS approved 501(c)(3) foundation. Our IRS Tax ID Number is 38-2680101. All contributions to the Foundation are deductible for federal income and estate tax purposes. From September to November of each year, each JCI Senate state organization (or foundation) distributes to schools and boards of education throughout their state the necessary application forms for determination of the recipients of scholarship grants. The deadline for return of the completed application forms to the state chairperson is at his or her individual discretion, and can vary from as early as December 1st to as late as the following January 15th. The deadline is shown on each state’s application cover page. An outside, independent panel of judges reviews each application received in each state and the two top ranked applications per state are forwarded to the Foundation. Another outside, independent panel of educators reviews the applications submitted from the states and the winners of the scholarship grants are selected by that panel. Qualifications for the Foundation’s scholarship grants are as stated above. No limit is set on the number of grant applications that can be submitted by students attending any given secondary educational institution. Although applications are judged at the state level first, eligibility is based on a student’s state of residence rather than the location of the college, university, or vocational school the student plans to attend. Applications will be reviewed and the top 2 will be sent to The National JCI Senate for their Judging. This is a US JCI Senate Scholarship – Applications can only be submitted through the New York JCI Senate. There is no guarantee for a specific number of scholarships to be given out. More info on the form. The preliminary copy of the Living Book, which is the brain child on Frank Castellano and Russ Williams, is available on the link below. 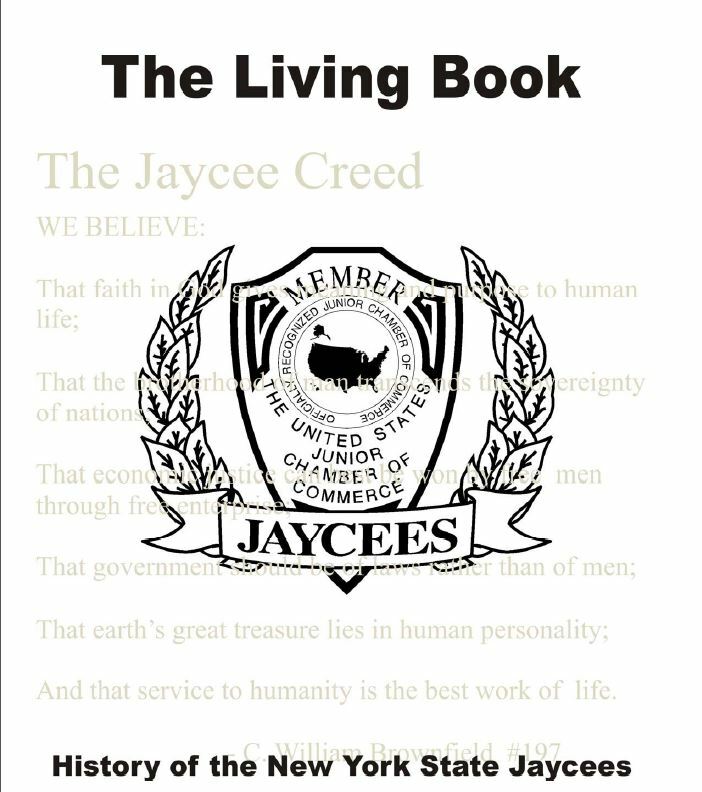 The Living Book is a history of the New York State Jaycees. If you have contributed to the book by providing a list of officers who served during your year as State President and/or by providing your Jaycee biography, summary of your year as President and a personal message let me thank you. You may want to review the material provided by your colleagues and fine tune your input. If you just haven’t found the time yet to provide input you have until June 10th to get your input to me. I will make sure that any updates and/or additions are part of the first printing of the book. Thanks in advance for your participation in this important program.